Although it is Dal lake that graces most picture postcards from Srinagar, it is in fact the river Jhelum (Hydaspes in Greek and Vyeth in Kashmiri) that the city’s life revolves around. It was the principal corridor of trade for centuries preceding the advent of motor vehicles, and it is along its banks to the east of the lake, that the historic centre – Shehr-e-Khas – and much of its cultural monuments are arrayed. We mean to begin our exploration of the old city at the Jamia Masjid or the Great Mosque in Nowhatta, but the green stupa like spire of the Naqshband shrine on the way, piques our interest. 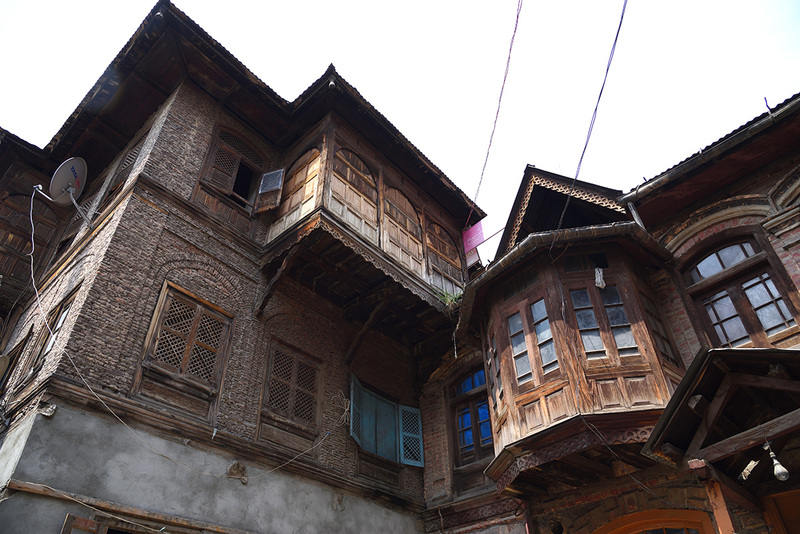 Our impulsive stop turns out to be the best possible introduction to vernacular Kashmiri architecture and it’s distinctive (and earthquake resistant) dhajji dewari construction. 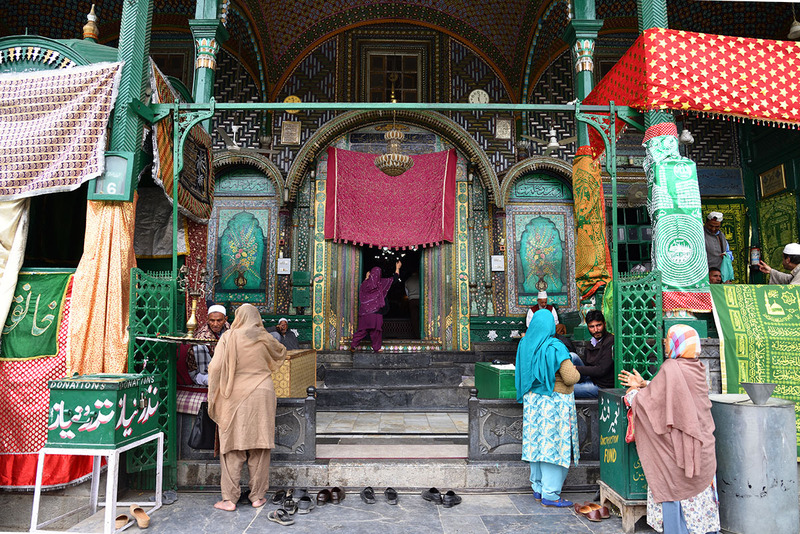 The 17th century shrine, or Ziyarat, is dedicated to Khawaja Syed Bha-u-Deen Naqsaband, the founder of the (worldwide) Sufi order of Islam, but it is a disciple who lies buried within. 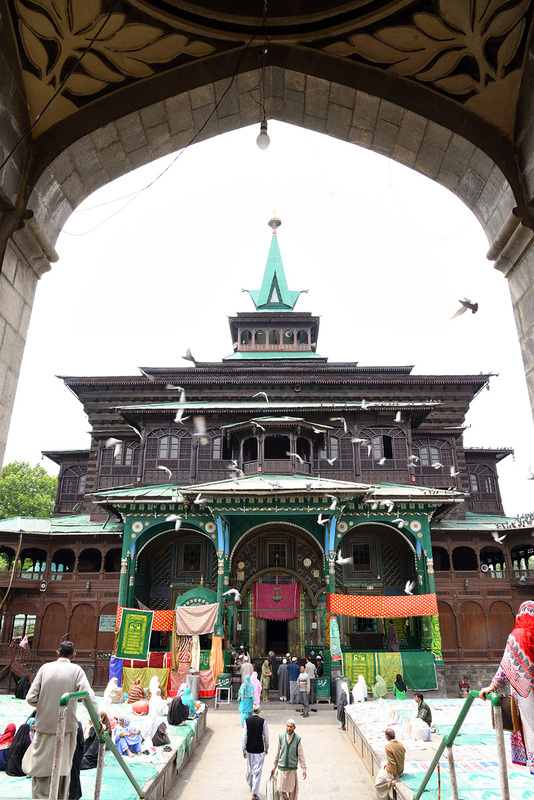 It housed the relic of the Prophet’s hair briefly in 1699, before that was moved to the Hazrat Bal mosque on the far end of Dal Lake. This is a tranquil spot, where I am invited to click photos of the interior from the doorway (unlike mosques used purely for worship, women are not allowed entry into (tomb) shrines), and I am oblivious to the fact that the 21 martyrs of a 1932 uprising against Hindu Dogra rule are interred here. It is only after my return that I discover, that the present conflict has roots going back to before partition. 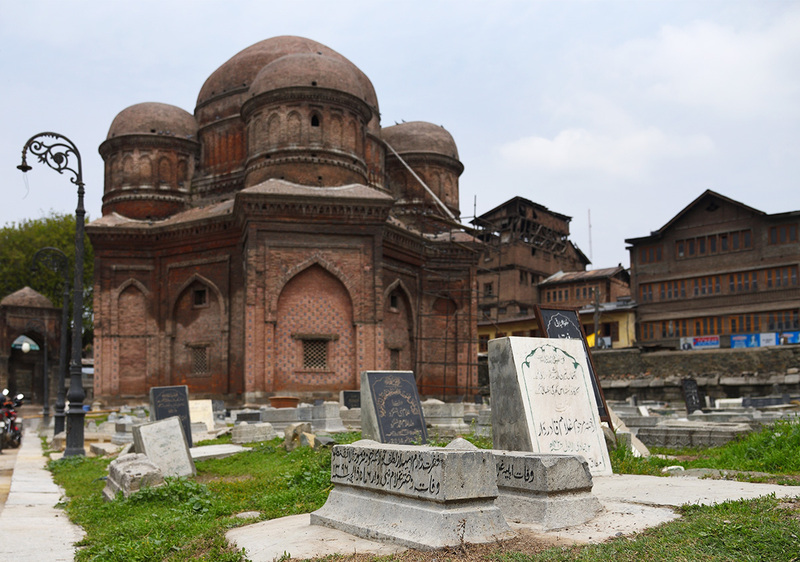 A controversial monument, just off the same (Ganderbal) road, is the shrine of Roza Bal, dedicated to Youza Asouph. 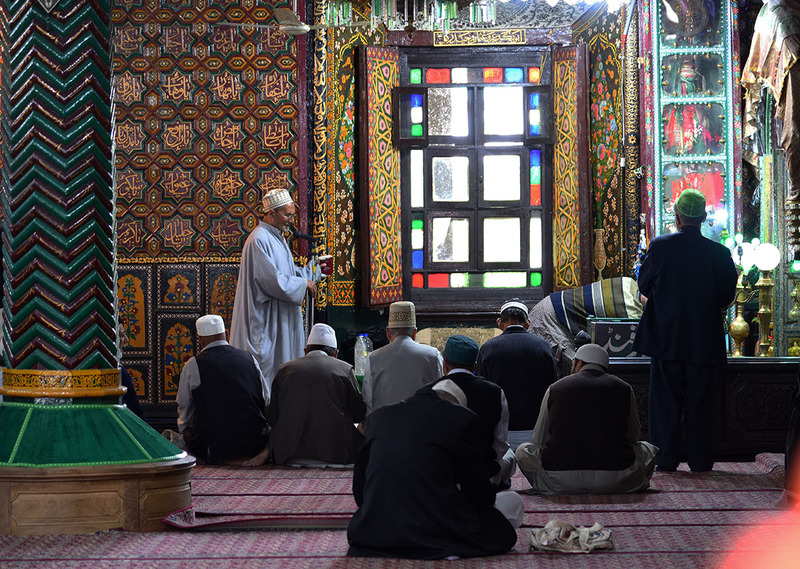 The simple shrine is believed by one Islamic sect, and many scholars, to be the grave of Jesus Christ, who they say, survived crucifixion and came to Kashmir in search of the lost tribes of Israel. That theory is blasphemous to most Muslims whose holy book claims Jesus was returned to Heaven alive. An attempt to exhume the bones of the interred saint (by an alleged descendant of Christ!) has turned the local community in charge of the shrine hostile to visitors. My mounting curiosity is nipped in the bud by my virtuous husband who will have nothing to do with ruffling religious sentiments. 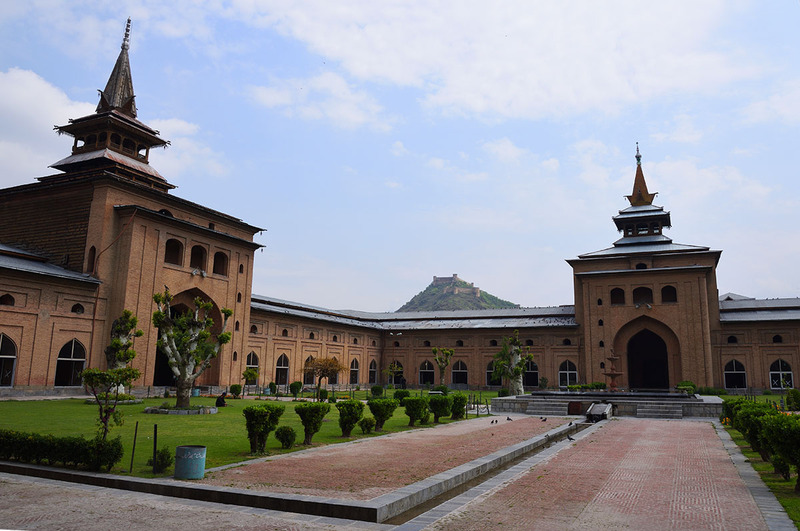 The enormous deodar pillared central hall of the Jamia Masjid. Inner courtyard, Jamia Masjid. In the distance is the hill top fort of Hari Parbat, now an army barrack. 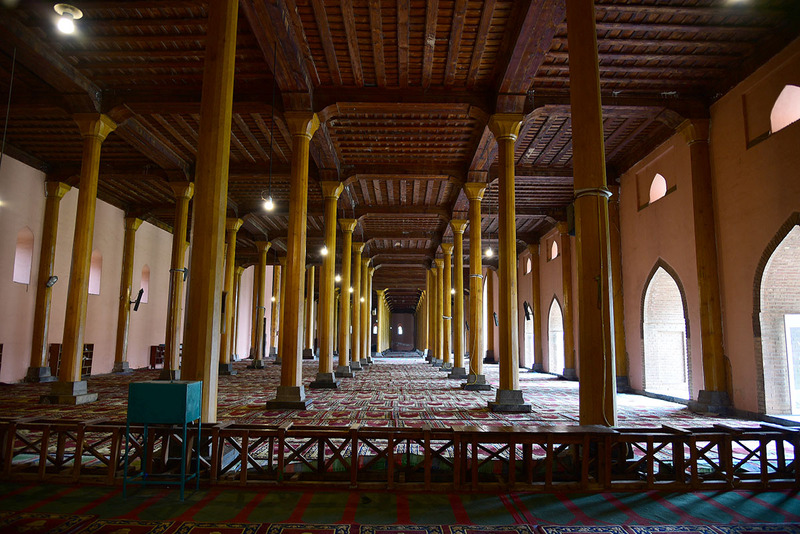 We reach the Jamia Masjid at a quiet time, between prayers, and have it all to ourselves, our whispered voices echoing off the walls of it’s austere, (allegedly 33,333 capacity) deodar pillared halls. This 14th century edifice, built over the foundations of a Buddhist temple, is the principle place of worship for locals as well as for political congregations. It is surprising to us that the mosque, even after several restorations, retains ethnic buddhist elements in the roof structure. The absence of Saracenic features in local (medieval) architecture, is attributed to a more peaceful transfer of power from Hindu to Islamic rulers, as compared to the Islamic conquests across the rest of the subcontinent. The first non Hindu to occupy the Kashmir throne is supposedly a Tibetan prince, Rinchan, who converted to Islam by accident! The bustling bazaars around the masjid bring to mind TV footage of violent encounters that rekindle concerns about safety. Our guide suggests we walk around on our own so we can judge for ourselves. 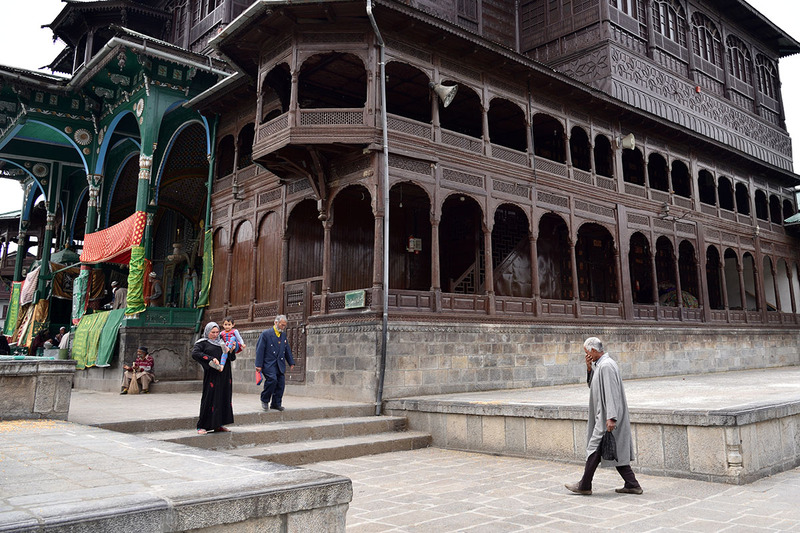 Shehr-e-Khas exudes the timelessness typical of other medieval towns in India. But it also feels more exotic somehow, more like the inner streets of Cairo, than the Chowk in Lucknow, despite a skyline devoid of domes and minarets. An example of Taq architecture. 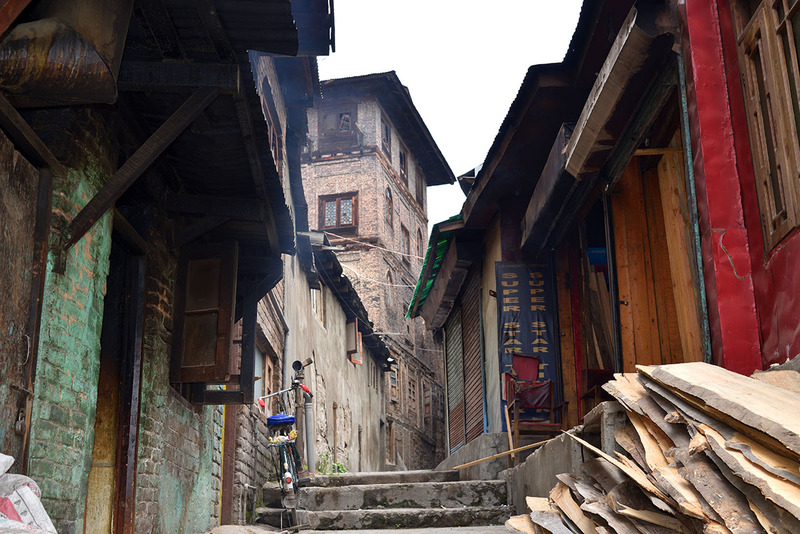 Unlike the timber framework and brick infill of dajji diwari, this commonly used form of earthquake resistant masonry system is typified by timber runners resting along load bearing walls. 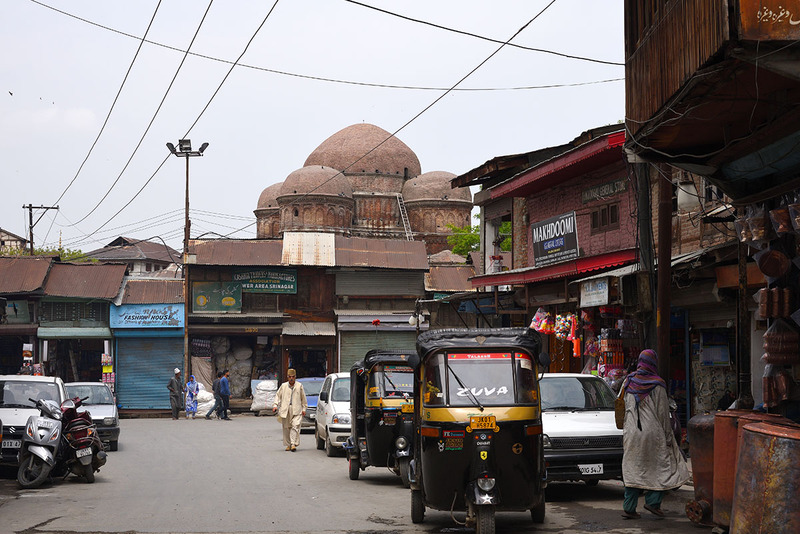 Street in Zaina Kadal, the neighbourhood that gets its name from the historic bridge. A (working) Hindu temple, a Muslim shrine and a tomb in the same frame…and the garbage choked ghats. Three story high timber braced houses lean precariously over narrow labyrinthine alleys jostling with bearded men with white crocheted caps, and fair, light eyed women in flowing pherans. The streets are organised into clusters of craft workshops. Coppersmiths, carpet weavers, woodworkers, embroiderers. The famed craft of Kashmir: the finest carpets, softest pashmina, intricate woodwork, the most vibrant lacquered papier mâché products were all once traded from showrooms on the ground floors of buildings lining the river. 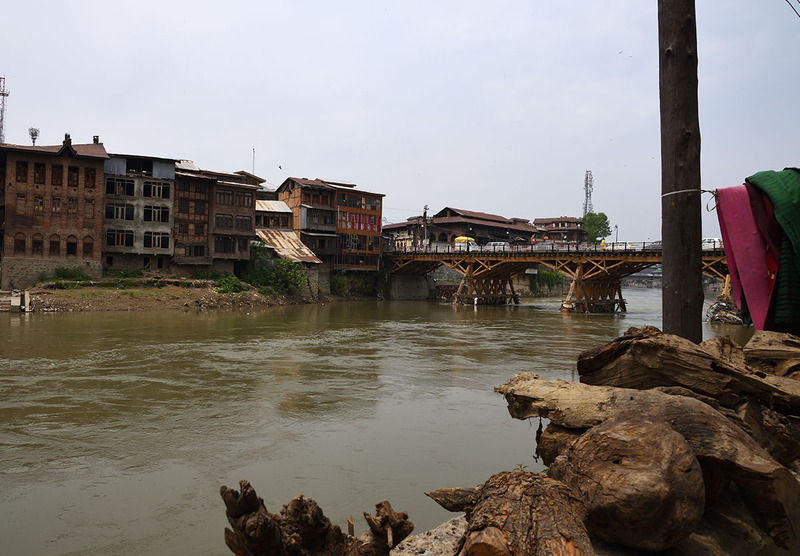 The forlorn, garbage choked river ghats (steps) before us, are telling of the current state of Kashmir’s endangered craft industry and it’s riverine trade. Much of the wholesale business, we learn, has moved inland. We spot our first domed building at the end of a long street. The 14th century Budshah tomb, was originally built by the ‘meritorious’ Sultan Zain-ul-Abidin, for his mother Queen Miran. Budshah, meaning ‘Great Ruler’, is the reverential nickname given to this tolerant son of the bigoted iconoclast, Sikander ‘Butshikan’. Budshah’s own tomb in an enclosure to the left, is completely ruined. The odd one out – Tomb of Budhah’s mother, Queen Miran. Czochworu, fresh from the oven. Zaina Kadal across the Jhelum. 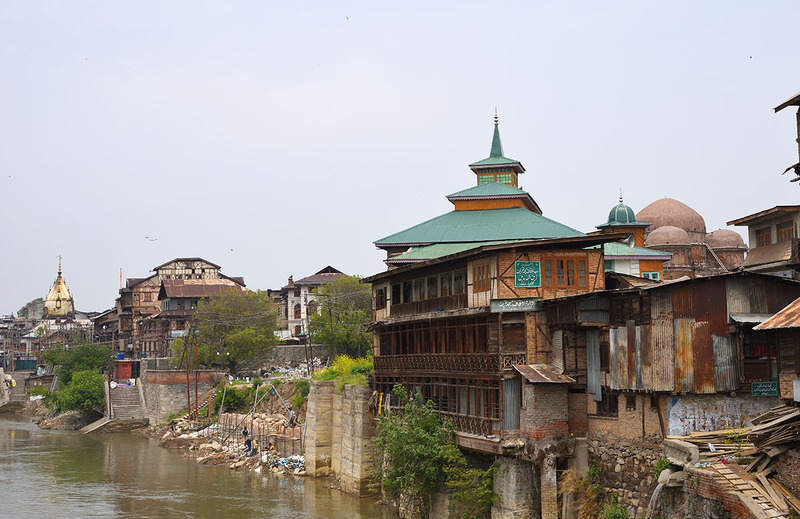 The Jhelum breached its banks in a devastating flood in Sept ’14. Our guide, Mansoor, rejoins us as we turn towards the river. 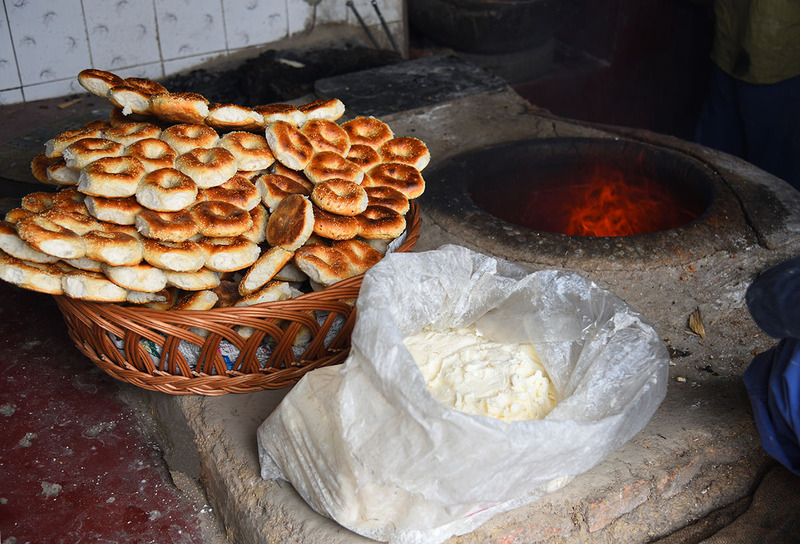 We directs us to a traditional bakery close to Zaina Kadal (Zaina Bridge) the oldest of eight historical bridges that straddle the Jhelum. Like in much of the middle East and parts of Africa, locals line up at dawn at communal bakeries for their daily bread. The simple Czot is served at breakfast and the slightly sweet and crusty Czochworu makes up the second round. 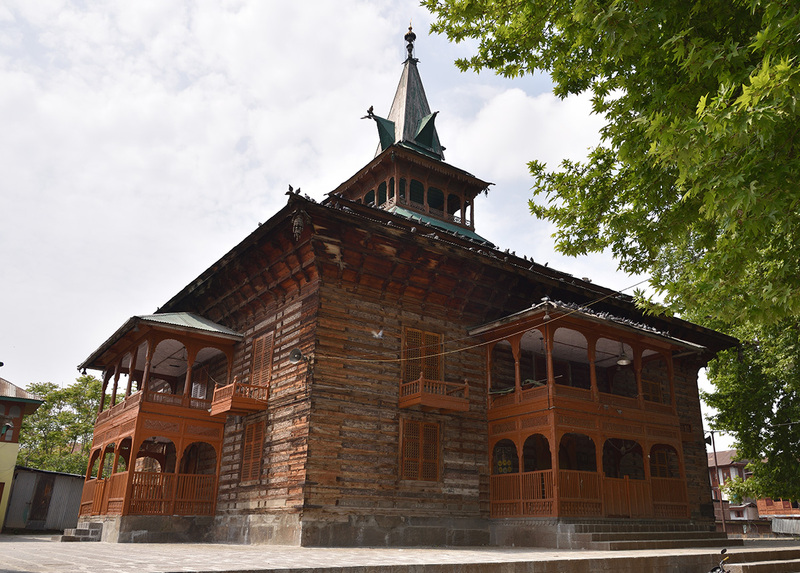 It’s a short walk from here to the jewel of Shehr-e-Khas, the exquisite wooden Khanqah-i-Moulla. 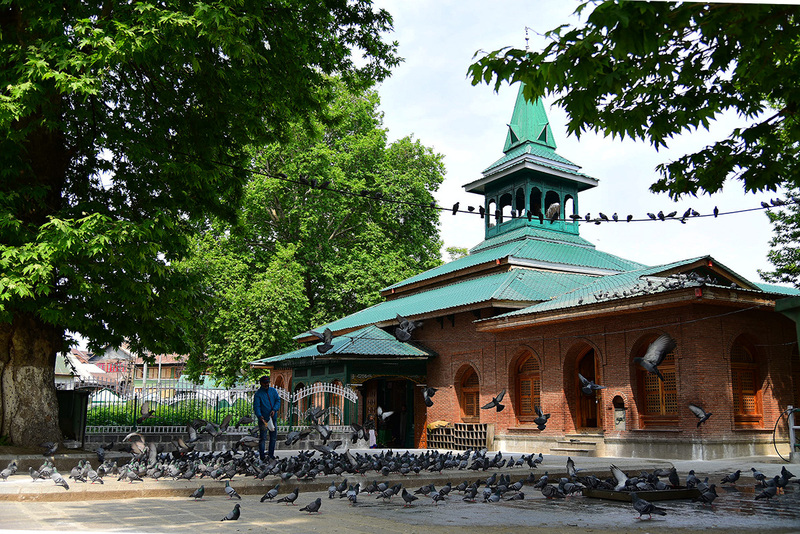 While commonly referred to as a shrine and a mosque, the Khanqah is neither. It is a prayer hall dedicated to the Persian mystic, Shāh-e-Hamadān, who is singularly credited with the Islamisation of the valley, and with the introduction of Persian fine arts, crafts and building skills. 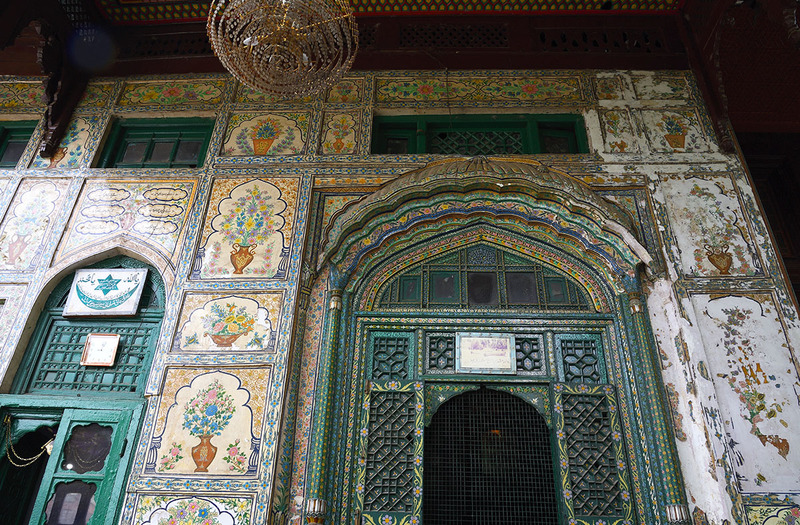 Non Muslims and women are forbidden entry, but photography of the elaborate lacquered khatamband (faceted wood panelling) interiors is permitted from the entrance or through the windows all covered in vibrant patterned papier mâché. The courtyard is milling with people…..praying, meditating, socialising, on what appears to be a special occasion. Amplified sermons periodically punctuate the hubbub outside. A female devotee on the steps to the shrine silently rocks to their cadence. A large samovar in a corner, dispenses piping hot Kahwa (Kashmiri saffron tea). A few women distribute fistfuls of saffron rice redolent of fresh ghee and fried onions. I could stay here all day, but we have a lunch date at Ahdoos and I am hoping to get to Pari Hill before the weather turns bleaker. We entered through the rear, so I climb up the steep front steps to the main gate in order to capture a final visual of the colourful, festive scene, complete with pigeons in flight. The perfect keepsake from this ‘city-special‘. What an extraordinary place, Madhu! I was so excited to see my name linked to this. Thank you very much! 🙂 🙂 I’m sitting in my garden on a surprisingly warm May day wondering how I can acquire some of those very nice looking bread rolls. 🙂 Bless you, darlin! Thanks for this. It doesn’t really matter when within the week it comes in, Madhu. It might get a little more attention from readers on Mondays but then you never know who takes the time to read. (and not everyone is a layabout like me 🙂 ) It will be a pleasure to share it. I’m so glad you did share this Jo, what a fabulous post Madhu. Kashmir is even more extraordinary than what I had in my imagination. I read them, Madhu, enjoying reading about places I’ll likely never see. The timber-braced buildings caught my interest and as I love bread, that did as well. 🙂 It’s also interesting that women may not enter certain places, but may take photos from the doorway. Thank you so much for giving me a virtual wander about this amazing place, Madhu! You are most welcome, Madhu! That was a lovely walk, and I enjoyed the history as well. If I were walking there, I’d probably walk straight into a building or into the street without checking for autos.. Instead I’d be gawking at the lines, colors, designs – so much to take in at once! Ha, yes, the distractions are many here. I was blown away by the colours and details of the Khanqah. Have never seen papier mâché used on a building facade before. Glad you enjoyed this Lisa. Indeed, and as fascinating to me as the state’s breathtaking landscape. Your account provides a fresh look of Srinagar, Madhu. It is very rare to read about the cultural and historical aspects of this city. Looking at the roofs of those mosques makes me think of the old mosques in many parts of Indonesia which still largely retain their vernacular architecture. Meanwhile, the story of Rinchan who accidentally converted to Islam is one of those fascinating yet bizarre twists in history. This post reminds me that places that are often avoided by most people — as long as they’re not engulfed in war — often reward us with the most unforgettable travel experience. I love the wood frame buildings. What a unique place! Unique even for me David. Have never seen that style of architecture before, although it might be prevalent in other northern hill towns. Oh Madhu I am smitten! I’ve never been to this part of India, and it’s been on the list, but now I see I really must get there one day. Wonderful photos, especially the front of Khanqah of Shah Hamadan with the pigeons, the third one of Ziyarat Naqshband Sahib, the interior of Jamia Masjid (those columns! ), the vegetable vendor, and the interior of Khanqah of Shah Hamadan. Thank you Alison. This was as captivating a part of my Kashmir experience as the fabulous landscape. Hope you do get to visit someday. One of the beauty spots of India. Hi Tony, so happy to see you! I was intrigued too by the paper mache and that it has survived in fairly good condition. I have linked to an UNESCO initiative above, that aims to conserve these ethnic building traditions. There is a reason why those traditions evolved and it would be such a pity to let them die down for characterless concrete structures. Appreciate your reading Tony, have a great day. Lovely read. Those art works on the walls and doors are gorgeous. Thank you Niranjan. Indeed the colours and details are exquisite. There are apparently no nails used in the building! Pleasure to see you here Indra. Downtown Srinagar is under curfew again! But I would still go, knowing that this walk is the only thing we would have missed if the curfew had happened while we were there. Wait for tempers to cool a bit and then, yes, just go 🙂 April is a good time, protests seems to escalate around May and peter out by the onset of winter. Thank you for this tour of a fascinating and beautiful place.It must have been an amazing place to experience. It was indeed! Thank you for reading. Thanks sharing and reviving the memories of Kashmir and its culture, art and craft. Pleasure to meet you Harbans. Thank you for taking the time to read and share your thoughts. Are you from Kashmir? I have also been writing about Kashmir but this shows the amount of research you put behind your blogposts. What a beautiful place Madhu! I have wanted to go to Kashmir for a very long time as I have heard a lot about the hiking there and how beautiful it is. How much time did you spend there? I would really love to see this part of the world. So much history too! We stayed less than a week Nicole. We are already dreaming of returning for a longer visit someday. What wonderful things impulse and piqued interest are! The construction of the Naqshband shrine is exquisite. 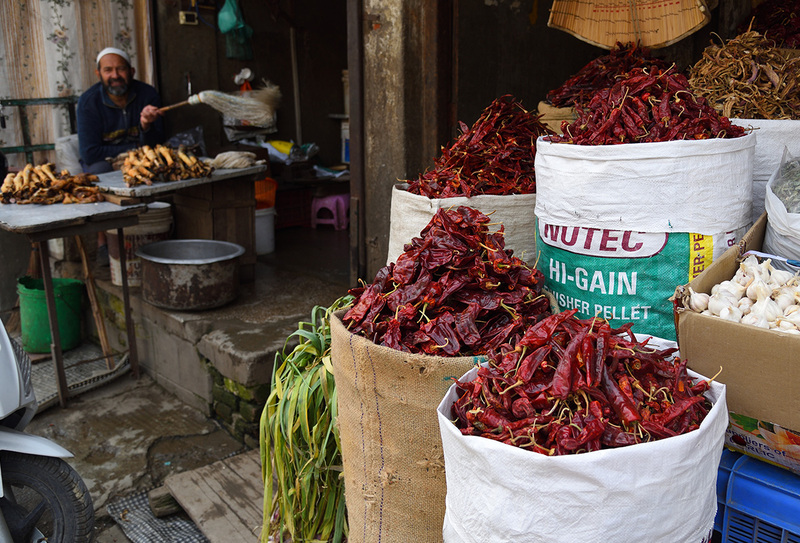 So is the forest of pillars, the Taq architecture, the piles of chillies. Interesting to see corrugated iron being its versatile self. So many different influences, so much history, all captured superbly by your eye, your camera, and your words. Always rewarding Meg 🙂 There are svereal more shrines scattered around the valley, although none as elaborate as the Kanqah….I think. Happy Tuesday Meg. Glad you enjoyed it. Thank you very much for reading Jodi. Fascinating post, Madhu. Wonderful photos and narrative. Hi Jane, so glad you enjoyed this post. Thank you very much for your lovely comment. Excellent write up with beautiful photographs. Thank you, I am glad you stopped by Syam. 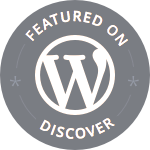 Just popped over to your site and was blown away by your Theyyam photos. Absolutely brilliant. This place is spectacular! Loved the photos, Madhu! Thank you Agnes. It is indeed a very atmospheric old town. Market places are the best to learn about lives… and a taste of local food, finishes the study perfectly! Beautiful photographs. Indeed, and markets are where I head to the first chance I get 🙂 Thank you very much for your visit and all the lovely comments. Much appreciated. Papier mâché façade? Really? I’d never heard of one. Really! 🙂 Not the entire facade, the upper portions are faceted wood panelling, but the painted surfaces around the windows and doors, even along the sides, are all papier mâché. I’ve never heard of one before either. Quite unique. Here they use papier mâché to produce fantasy animals/monsters called “alebrijes”. Quite original. Have a nice week-end Madhu. I do hope all health issues gradually sort themselves out. Sometimes all it takes is a bit of time and (a lot) of inner strength. Take care. B.
Splendid photographs of the architecture and even more beautiful writing, as always. Am so so glad you had a nice and safe trip before the troubles began in Kashmir. Thank you Shubham. Yes, we would have missed this walk certainly. But I’ve been checking Trip Advisor forums, and travel to other parts seemed to continue even during curfew with traffic into and out of Srinagar restricted to non curfew hours. Things do look like they are headed downhill though, unless someone steps down. Sad. Yes, the architecture is very distinctive, not at all like what I saw in Rajasthan. What a fascinating place, one I’ve often fancied visiting Madhu and I’m not surprised at the reaction you received when you announced you were going. Oh my, Madhu – what a visual treat this is! 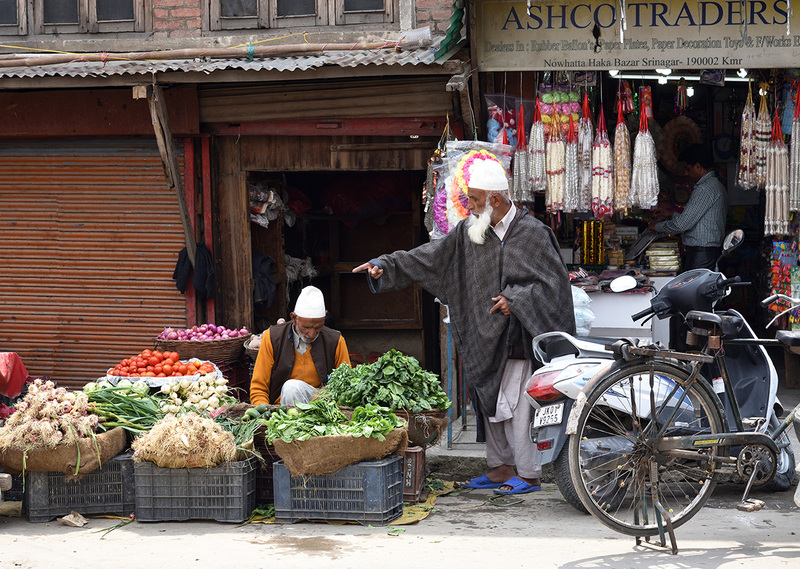 So much is completely new to me – the fact that Srinagar even had an old town, the mouth-watering czochworu, the vernacular architecture that leans more towards Persian and Turkish styles… I especially love the wonderful spires atop those mosques, shrines, and prayer halls. 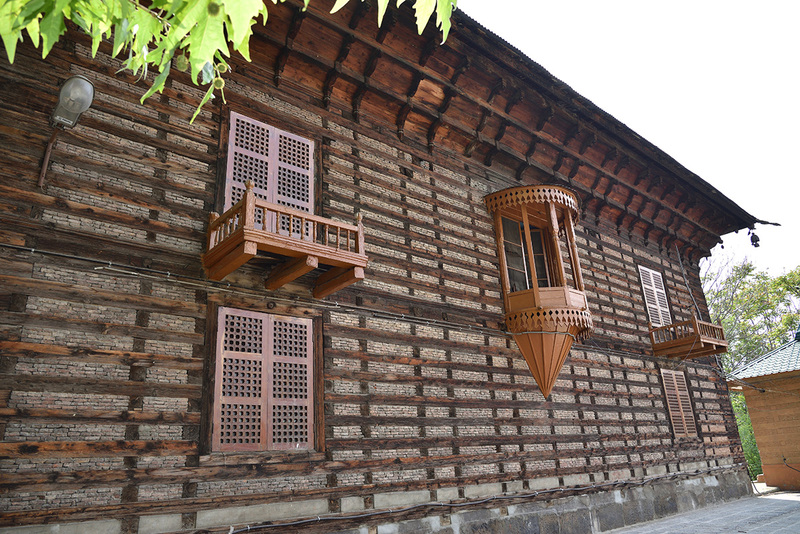 It is so interesting to see wood being such a dominant feature of Kashmiri landmarks, as opposed to the stone monuments elsewhere in the subcontinent. And I never imagined I would ever see papier mâché being used as a cladding material. As ever, your historical accounts had me jumping all over Wikipedia! Beautiful post, Madhu…made me feel like I was there. I have traveled quite a bit all over India but never made it to J&K. One of my regrets. My husband went to Srinagar though and he still fondly remembers his meals at Ahdoos!